Our skilled dental professionals will ensure your visit is both relaxing and informative. Our dynamic team brings a wealth of knowledge to our dental suite as well as a friendly and warm disposition to assist our patients in feeling relaxed and comfortable. Andrew is a fastidious dentist who enjoys complex restorative dentistry. Andrew graduated with his Bachelor of Dental Sciences (BDSc) from The University of Queensland in 1990, having previously completed a Bachelor of Dental Studies (BDSt) research degree. He spent his early years in Far North Queensland, a place and time where specialist dental support was thousands of kilometres away. The importance of achieving the very best possible care with his patients was seen and emphasised. Here his passion and skills in all aspects of general dentistry flourished. He gained a true appreciation of what, with top-quality dentistry and a thorough understanding of all dental techniques, he can offer his patients. He returned to Brisbane before settling in Newcastle in 2000. He gained level III Accreditation with the Australian Society of Implant Dentistry in 1995. 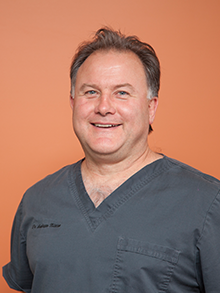 Andrew has a particular talent and passion for dental rehabilitation through dental implants and laser dentistry. All dentistry that Andrew undertakes bears aesthetic results and function with predictability and long term results. He maintains membership in the ADA, the Australian Society for Endodontics and the Australian Osseointegration Society. Andrew founded the Honeysuckle Dental practice during 2010 to provide the best possible environment for patients and staff to share his passion. Andrew balances his life with other interests that include road-cycling, mountain-biking, German Shepherd Dog’s and his family. Kristie-Lee grew up in the leafy northern suburbs of Sydney. Her interest in the dental profession was sparked after commencing part time work at an orthodontic surgery at the age of 14. She completed a Bachelor of Nursing (RN) degree in 2008 at the University of Newcastle, working most recently as a perioperative nurse with a focus in oral and maxillofacial surgery. 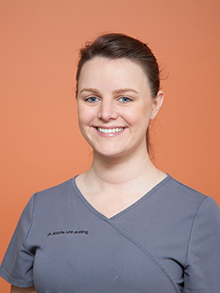 Kristie-Lee completed a Bachelor of Dental Science at Charles Sturt University in Orange. During her studies, Kristie-Lee found a wonderful passion for rural health and an appreciation for holistic health care. She believes in delivering a high standard of care to all patients, and prides herself on attention to detail. A member of “Team Philippines”, Kristie-Lee is involved in a biannual mission to provide dental and medical care to a remote village of 500 families in Calauan, Philippines. Kristie-Lee enjoys all aspects of dentistry with a particular interest in endodontics and oral surgery. She holds memberships with the Australian Dental Association and NSW Nurses and Midwives Association. She has an incredible appetite for life, with a passion for surfing, wakeboarding and water sports. She loves mountain bike riding and has travelled widely within Australia, and around the world. Kristie-Lee is thrilled to be living in Newcastle, enjoying all that this city and its beautiful beaches has to offer.